Prairie State Conservation Coalition is partnering with Illinois Realtors to help educate and promote awareness of conservation opportunities for healthier land, and, of course, healthier people. Incoming president Dan Wagner, a trustee with The Conservation Foundation, outlines the proposal he will cultivate as he moves into his new role leading the state’s real estate industry. These are the first five words to the Preamble of the Realtor Code of Ethics. When you boil it down, the essence of our commercial and residential real estate industry is all about the land. Illinois Realtors recognizes this fact and is going to take this next year to partner with the Prairie State Conservation Coalition to increase the health of our land and our people. What is the Prairie State Conservation Coalition? It is a statewide non-profit organization created to assist conservation land organizations as they work with landowners and communities to protect land and water resources in Illinois. Illinois Realtors and the Prairie State Conservation Coalition will facilitate the education and collaboration efforts between the local Realtor Associations and local land conservation organizations. Conservation Easements are a great way for private landowners to voluntarily preserve natural resources with no requirement for public access. The easement limits the type and amount of development which can occur on a property. The property owner may qualify for income tax deductions for the value of the easement because they are giving up the ability to develop part or all of the land they own. They can take this deduction for up to 16 years. In some cases, property taxes can be reduced by up to 75 percent. And, there are cases where an easement could reduce the amount of estate tax that is owed. There are approximately 1,700 conservation easements in Illinois encompassing more than 235,000 acres. Many of them preserve natural areas, but there are plenty that preserve working lands (such as farms), too. Our local Realtor Associations and our local conservation leaders are already very involved with beautifying their communities through a multitude of projects. Illinois Realtor will help identify National Association of Realtor grant money to assist with refurbishing park areas, downtown thoroughfares and a multitude of other projects that can be implemented through these collaborations. Developers will tell you how important storm water management is to a project. Working in conjunction with land conservation leaders, money can be saved on storm water detention ponds by having native perennial plant buffers installed to reduce silt buildup instead of expensive rip rap or steel walls. These plantings have extensive root systems, which means once they are established, these plants don’t require watering and frequent mowing, thereby reducing the costs for maintenance. These plantings also deter Canada Geese because the birds avoid taller vegetation where they cannot easily spot predators. There are also innovative ways to create parking lots with permeable pavement and natural plantings which assist with storm water management. Besides serving an important storm water function, native buffers, rain gardens and other landscaping can look pretty and attract birds and butterflies. It is a fact that people pay more to buy and rent homes when the properties are located near parks and forest preserves. 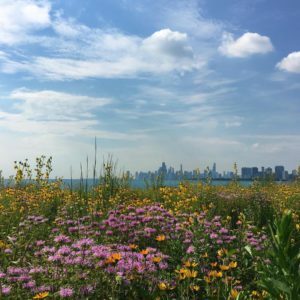 Natural plantings enhance property values and conservation leaders can assist you in making selections that attract pollinators such as bees, butterflies and birds. They can also offer advice on using native plants to turn “problem” wet areas in your yard into beautiful rain gardens. There are very active Realtor Young Professional Network members throughout the state and they are being asked to partner with their local land conservation organization to join the already established river and stream clean ups in their communities. The benefits of land conservation is especially needed in under-served communities. Collaborating with our local Realtors and conservation leaders to identify abandoned weed invested lots and transforming them with natural plantings increases the pride and value in a neighborhood. Connecting Realtor groups with already existing conservation programs that encourage children to not only be educated about nature but to have experiences of going into nature as well. Our computer and cell phone screens connect us with work 24 hours a day, seven days a week. The lives of many of our Realtor members and clients are increasingly stressful as a result. So, as an association we want to promote to our members the value of getting out in nature. The act of going for a walk in the forest is nothing new, but there have been recent scientific studies showing a multitude of health benefits from outdoor activity including stress reduction and increased personal satisfaction. Illinois Realtors is looking forward partnering with the Prairie State Conservation Coalition because we all know land is everything for our real estate industry and it is our duty to be the very best stewards we can of this amazing resource! If you have any questions or if something you read sparked an idea, please feel free to call Dan at (630) 218-4953. Posted in: blog, news & events.